At nearly two, our son is starting to enjoy cuddling up to a good book read by his mother or me. We have quite a collection of books that was given to us by his generous grandmother, including great titles from Dr. Seuss and Arnold Lobel. There are good lessons in these for children. There were a few Christian titles, but we still wanted to expand our boy’s choices of Christian children’s literature to fuel a hunger after God early in life. As part of that quest, we came across the book, Ronnie Wilson’s Gift by Francis Chan. The book tells the story of little Ronnie Wilson. One day in Sunday School, Ronnie learns that Jesus gave him the ultimate gift through His death and resurrection. 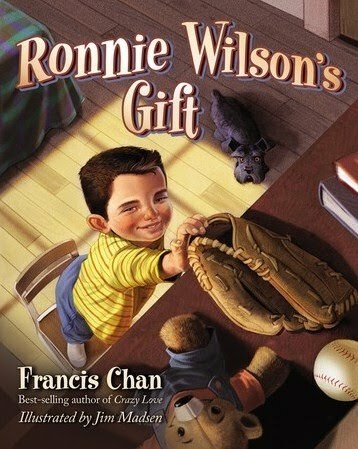 Ronnie is so thankful that he wants to give Jesus a gift in return, but it’s hard to get your favorite baseball glove to heaven. During his attempts to send Jesus his gift, Ronnie takes the time to help some people in need. At the end of the book, Jesus appears to Ronnie in a dream and tells him that all those things he did to help others was like doing them for Jesus, so Ronnie gives his baseball glove to a boy in need of one. My wife and I cry every time we read it to our son. Not because the story is particularly moving but because Jesus is particularly moving. That He would empathize so much with those in need that He makes charity given to them equivalent to charity given to Him, our King, is mind-boggling! No wonder we’ll sing of His love and His mercies forever. If you’re looking for a gift for a child in your life, I whole-heartedly recommend Ronnie Wilson’s Gift .